Vintage 1981 Ferrari press release on the Grand Prix of France held at Dijon. Mentions that Gilles Villeneuve and Didier Pironi will be driving the Ferrari 126/CK as well as the spare car being a 126 / CK. Contains quotes by Mauro Forghieri, Didier Pironi and Gilles Villeneuve and sections on "Private Testing" and "Sporting Point". 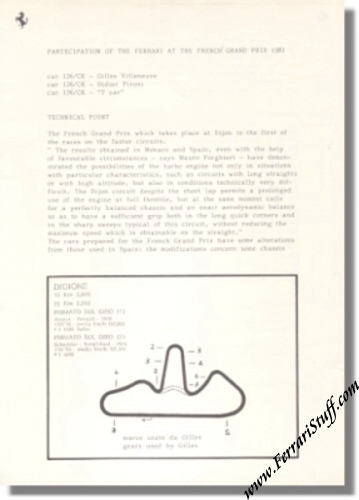 Also shows a map of the Dijon track with the gear shifting points of Gilles Villeneuve. Issued before the race for the motoring press in Dijon on July 1, 1981. Available in English and in Italian. Gilles Villeneuve had to abandon in lap 41 with electrical problems. Didier Pironi finished the race in 5th position, 1 lap behind winner Alain Prost on Renault.